I hope everyone's had a marvellous Christmas - I certainly have. 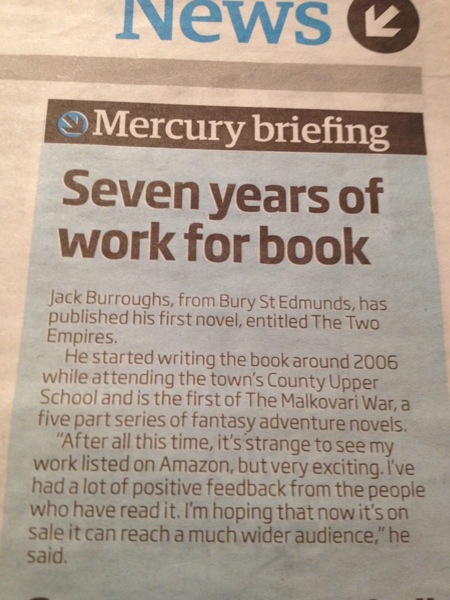 One particularly exciting Christmas surprise was spotting this little article in my local newspaper, announcing The Two Empires to the people of Bury St Edmunds and its surroundings. Not sure yet how many of those people will be interested, but it's certainly good publicity, especially considering it only required a simple press release on my part. Also very nice to discover was this new review on Amazon.co.uk. A big thank you to Mr Tomlinson! So far that makes 2 reviews, both 5 star and complimentary, which is very encouraging. So enjoy your turkey sandwiches/festive leftovers of choice, and if you fancy sitting down to read something while you digest...well, you can probably guess the rest.